Not that you need an excuse to toast Mom or yourself if you’re a Mom, but May 11th aka Mother’s Day is coming. Start off the celebrations to the lady who brought you into this world, among many other miraculous feats she pulled off for you, with one of these vodka or champagne cocktail recipes in honor of TV moms. Grab the family recipe book, some glasses and make mom’s favorite meal, paired with one of these TV mom-themed cocktails. Because, as the saying goes: moms know best! Carol Brady Punch – This serves a bunch! Add all ingredients and ice into a punch bowl. Generously stir and serve. Add all ingredients into a flute and serve. Louis deserves this after dealing with Peter for all these years. 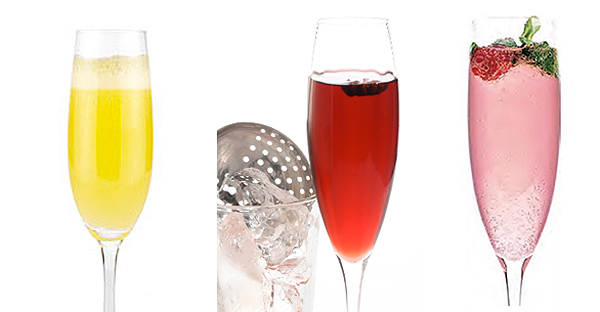 Combine CAMUS VS Elegance Cognac and raspberry liqueur in a Champagne flûte. Top with Champagne and garnish with raspberry. Fill a tall glass with ice and add Lucid Absinthe and Sobieski Black Cherry Vodka. Add lemon-lime soda and raspberry liqueur. Garnish with a lemon wedge and serve. Lucy loves it! More chi-chi champagne cocktails here. Thanks for sharing nice ideas. Most of these are with citrus flavor. I like the citrus flavor with vodka I have tried so many citrus flavor vodka cocktails with my favorite Anestasia Vodka.